Jazzを中心に都内で活躍中の愉快な仲間たち。This&That Cafe New Year JamではおなじみのボーカルYUMINGO。今回も熱いステージをお楽しみに!!!! 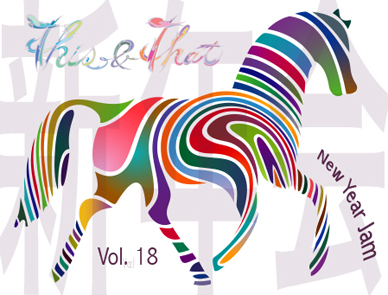 This&That kicks off 2014 with an eclectic array of musicians and visual artists that promises to get the New Year off to a great start. This event marks the #TnTCafe 3-Year Anniversary, and it’s a Friday night so you know it’s going to go off! The Sakamoto Band are a group of friends who play mostly Jazz in venues across Tokyo. Vocalist YUMINGO has been a guest at the This&That Cafe since its inception in 2012, and she promises to deliver another stellar performance with this new ensemble. Beginning Ballet and Jazz in her childhood, Nanami was at once trying to get into “show biz” but also got became interested in International Politics/Economy and entered the English Department of Sophia University in Tokyo Japan. In 2007, she moved New York City where where she worked as a dancer and at a contemporary dance company and a teaching assistant at a children’s dance school. After returning to Japan, Nanami entered the pageant circuit where she can work both on live performance and charity work at an international level. She has participated in international pageants as Miss Japan with women from more than 60 Countries. She is also working as a dancer/model and translator in the Japanese Kimono Dress Performance Unit ”美(Be)JAPON”. In the summer of 2014, she will join the a to Switzerland and France with Be・JAPON and renowned florist Shogo Kariyazaki. Hailing from Adelaide, Australi, Matt Stuckey is the founder of “Be Friendly.” Be Friendly is a design studio dedicated to producing highly creative work across disciplines; art direction, branding, interior design, product design, illustration, custom typography, curated projects, large scale public art… and whatever else seems like a fun and useful way to spend their time. Be Friendly proudly does a lot of work with smaller businesses, start ups, NPOs and the arts/creative community, investing their creative energy and experience into people and brands that they believe in. Be Friendly believes in original, fun, thoughtful and ethical design.